An emergency tuberculosis clinic is taking over the community hall in Qikiqtarjuaq, Nunavut, on Feb. 5. The mobile clinic will run for seven to 10 weeks and will screen every person in the community of 600 for the disease. 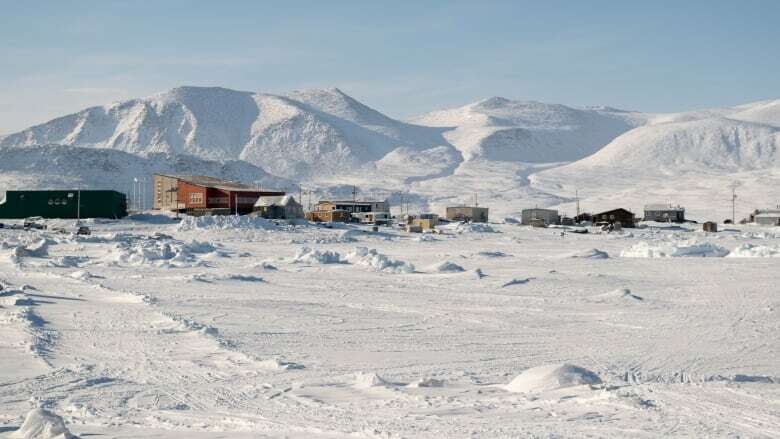 Qikiqtarjuaq, a hamlet on the eastern coast of Baffin Island, has the highest rate of tuberculosis in the territory, with almost 10 per cent of the population infected. Dr. Kim Barker, Nunavut's chief medical officer of health, says 17 of the territory's 25 communities have cases of tuberculosis. "It's now hit a point where if you just take one patient and screen all their contacts you might as well have screened the entire community," Barker said. Symptoms can include a fever, sweating, loss of appetite, unintentional weight loss, and coughing up phlegm or even blood. Tuberculosis can lead to death if left untreated. If this new approach to treatment goes well, the clinic will be packed up and rolled out in the remaining 16 communities. The clinic will cost nearly $1 million to host in Qikiqtarjuaq, but the equipment, provided by the Public Health Agency of Canada, is mobile and will be reused in other communities. The government of Nunavut applied and received most of the project funding from the federal government. Barker said the mayor of Qikiqtarjuaq has been helping the Health Department identify households that can be brought in all at once for screening. The Department of Education has provided the team with class lists so no children are missed. Around 12 medical personnel will be on the ground for the clinic's duration, including respiratory therapists, X-ray technicians and an epidemiologist. Technicians are already in town setting up computers and X-ray equipment. Pillows, blankets, blood pressure machines, crash carts, privacy screens, and contagion-proof testing cubicles have also been shipped up. This mobile clinic is what the Public Health Agency of Canada sends out in emergency situations, as they did during the 2016 Fort McMurray wildfires. The team will check back in a few months to ensure those residents put on drug treatments have stuck with the routine and beaten the disease. The project will be reviewed by two tuberculosis experts in March and they will follow up annually for the next four years to make sure the program stays on track. In 2017, Nunavut had 100 cases of active tuberculosis, making it one of the highest years on record since the territory was formed in 1999. In 2016, Nunavut had just 53 cases. Tuberculosis can be either active or latent, meaning someone infected can either exhibit symptoms and be contagious, or have the germ that causes the disease — Mycobacterium tuberculosis — lay dormant in the body. Those who catch the disease often do so by breathing in airborne particles carrying the germ coughed out by someone with active tuberculosis. 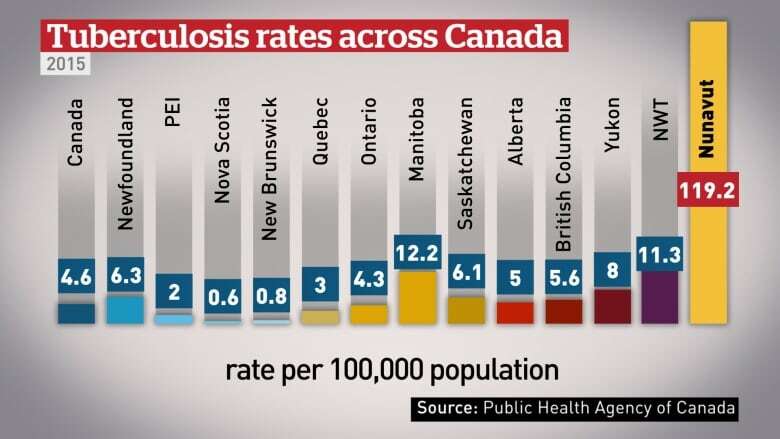 In about five to 10 per cent of cases, those with latent (or dormant) tuberculosis see the disease turn active, according to tuberculosis expert Frances Jamieson with Ontario Public Health. This is more common in children, the elderly and those with compromised immune systems. Why so many cases in Nunavut? The germ can hang in the air for several hours, Jamieson says, so tuberculosis spreads well in poorly ventilated, overcrowded homes, which are prevalent in the territory. "I think it doesn't help that with the winter we spend probably more time indoors then we do in the South," Barker said. She says the frequency of use of tobacco products in homes also contributes to coughing, so individuals might mistake their symptoms for smoker's cough. "It's not until you get very sick and then at that point you have infected a number of people," Barker said. Children don't always cough as a symptom, Barker says, so in Qikiqtarjuaq the medical team will be inducing and looking at sputum, matter coughed up from the throat or lungs, for signs of tuberculosis. Skin and sputum tests will likely diagnosis someone with the disease, but Jamieson says it takes lab work to confirm the diagnosis. Barker said that in the past samples have been damaged or frozen en route from Nunavut to labs in the south, and the time lag for shipping means some people are diagnosed later than they otherwise might have been. In addition, she says screening might never have been as high as it needed to be as a result of the Nunavut Department of Health being short-staffed and underfunded. But Barker said there could be another reason why infection rates are climbing: the department may be confirming more cases because awareness and resources are on the rise, not necessarily because more people are infected. Nurses now hired in Nunavut will complete tuberculosis-specific training, which will include the history of the intersection between colonialism and tuberculosis treatment in the territory. Also in the works is a community engagement strategy, which will aim to reduce stigma associated with the disease and help prepare those diagnosed for the isolation and difficult drug treatment needed to combat it. Barker says this push and the national task force created to address tuberculosis will make a difference, but it will take "phenomenal effort" to eradicate the disease in Inuit Nunangat, the Inuit regions of Canada. This story has been updated to clarify the number of active tuberculosis cases in Nunavut in 2017. The Nunavut government originally reported there were 101 cases, however, one was revoked, bringing the number to 100. Mass screening for tuberculosis to resume in 2016 in Salluit, Que.